The Crab Nebula is the result of a supernova explosion which was seen by astronomers in Asia in the year 1054 AD. The explosion blew the outer layers of gas off a star, and the ejecta has been flying outwards through space at high speed ever since. Here are a couple of pictures showing the expansion. Image taken by Adam Block with the Kitt Peak Visitor Center's 0.4 m telescope and a CCD camera. Courtesy of Adam Block, NOAO and NSF. choose "Edit" -> "Paste as New Image"
choose "View -> Measurement units -> pixels"
You can note the pixel position (x, y) for each star (or any other feature), and then calculate distances between features by using the Pythagorean Theorem. Here's an animated image which blinks back and forth between the two. Note how the stars (mostly) remain fixed between the exposures, but the gas moves. You will need to use the spectrum of the gas to estimate the speed with which it is expanding. The spectrum is show below. The units of wavelength are Angstroms: one Angstrom is 10^(-10) meters. 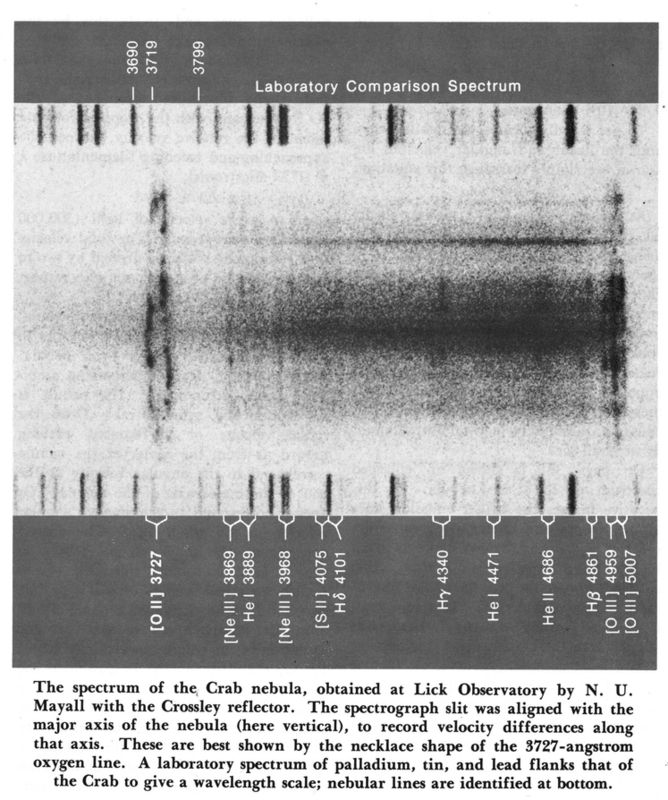 You can find another lab on the Crab Nebula at http://www.astro.lsa.umich.edu/Course/labs.html . Thanks to Julia Plummer at the University of Michigan.